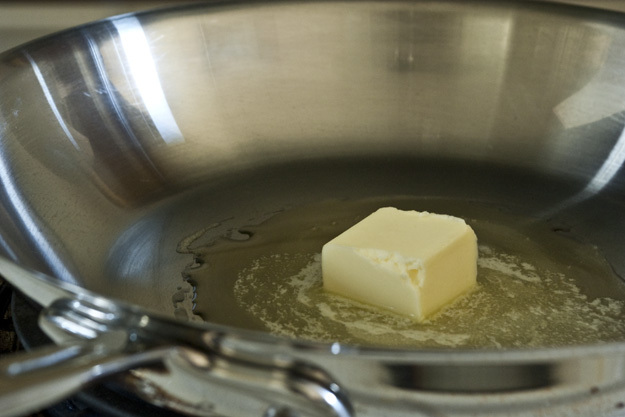 Begin by melting 2Tbps of butter over medium-low heat in a 10″ fry pan. 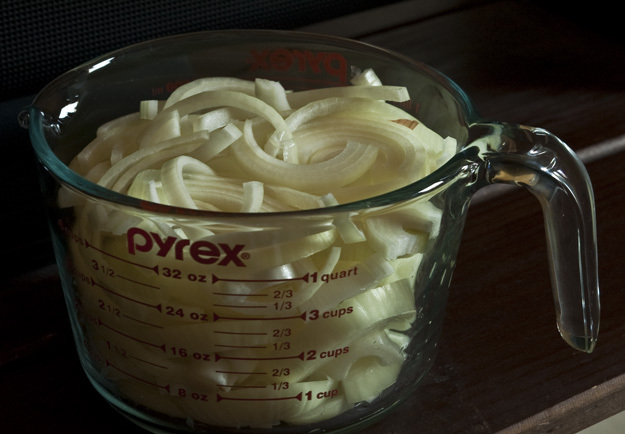 Meanwhile, halve 4 small or 2 large sweet onions and cut into 1/4 inch half moons. Tip: A mandolin slicer with a 1/4 inch blade will make this process so much easier. Be mindful of your fingertips, though! 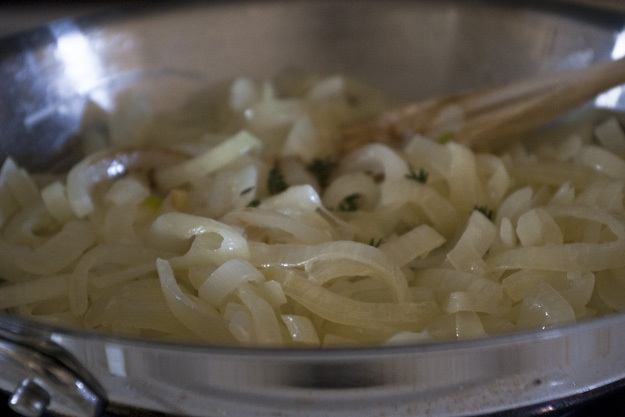 Once the butter is melted, sweat 4 cups of onions over medium-low heat with a lid on for 20-30 minutes until slightly tender and the onions have released their juices. Tip: the onions should not sizzle at all. If you hear sizzling, turn down the heat. Once the onions have released their juices, add in 1tsp Balsamic vinegar, 1 tsp dark brown sugar, and the leaves from 1 sprig of fresh thyme (no salt!). Place into a pre-heated oven. 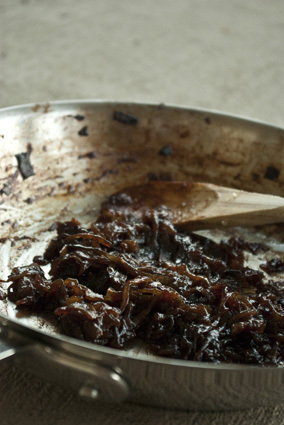 The onions will take about 3 to 4 hours to fully caramelize. Every hour, add in the same vinegar, sugar, and thyme mixture, stirring every thirty minutes or so. The goal of this process is to create a layering and depth of flavor as the balsamic will sweeten, the sugar will caramelize, and the thyme will perfume the mixture as it cooks. 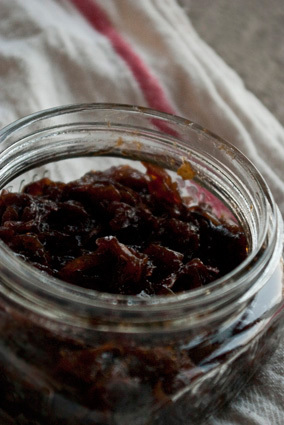 When the onions are fully caramelized, repeatedly add in the balsamic,brown sugar, and thyme mixture, cooking for 15 minute intervals, and tasting as you go, until you are happy with the flavor and texture, and the color has reached a dark, jammy brown. When you feel that the onions are finished, season with salt and fresh ground black pepper and add in one last teaspoon of balsamic vinegar (the flavor will mellow in the fridge). Smash with a sturdy fork or chop with a knife until the mixture has reached a jammy consistency and is well-combined. The jam would be delicious on a warm slice of toasted baguette with a smear of Brie cheese and maybe even a light sprinkling of finely chopped fresh rosemary. You could also try it plain on a piece of soft wheat bread for a quick, semi-healthy snack. P.s. I don’t know how long the jam will keep. Here is the USDA website for canning and storage information. .-= bodrum otelleri´s last blog ..Geleneksel Tarihi Bodrum Evleri =-. Bodrum – thank you. I’m glad you enjoyed! Ucuz Tatil´s last [type] ..Merhaba Türkiye!